In early 2010, the federal government created the Innovation Fund for the Hardest Hit Housing Markets (Hardest Hit Fund), which provides funding to state Housing Finance Agencies (HFAs) so they can offer innovative measures to help homeowners in states hit the hardest by the housing crisis and economic downturn. This program offers homeowner Down Payment Assistance & Down Payment Grants which if qualified never have to be paid back. Thousands of families and individuals who can qualify for a mortgage loan may still need assistance to reach the dream of homeownership. NHF strives to meet the needs of today's homebuyers through the development and management of various housing programs. Each program offers a unique source of assistance, whether that is down payment and/or closing cost assistance, or possibly a tax credit through a Mortgage Credit Certificate. The home buying process can be very intimidating to both first-time and previous homeowners. In addition, there's also a fairly common misconception that a down payment of 10 or 20 percent is absolutely necessary in order to purchase a home. It is important that real estate and mortgage professionals are educated about available down payment assistance (DPA) programs and pass this information on to potential homebuyers. 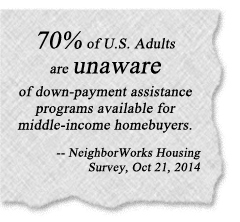 Many programs are not limited to first-time homebuyers either, which expands the opportunities even further. Visit our Program Index to learn more. Down payment assistance programs provides a variety of options for you to purchase a new or an existing home, a second property to add to your portfolio. ACCESS GUIDELINES, PARTICIPATION REQUIREMENTS, ETC. Programs are made available to potential homebuyers through a network of qualified lenders and energy efficiency contractors. Visit our Program Index for program descriptions, program guidelines, participation requirements and more.